Went out of their way to help us work the DVD player. Loved sitting on the deck/porch overlooking the river in the mornings & evenings. Art and Amy are So wonderful, We had a storm come throuh and power went out, That Angel Amy came knocking on our door with COFFEE!!! IT DOESN'T GET ANY BETTER THAN THAT! Amy and Art Klass go above and beyond expectations to make their guests feel welcome. They promptly respond to guest requests. The hospitality extended by both of them made us feel welcome and comfortable. This was our first visit to the Arkansas White River Cabins and we couldn't be happier! The cabin was super clean and the views are spectacular! Amy and Art Klass' cabins look out over the White River and the Ozark Mountains, with gorgeous sunsets as an added bonus. This experience was so much better than staying in a motel room. We can't wait to stay again! Art and Amy are amazing to work with and the property is being updated and changed every time we go!!! I highly recommend it!! We love staying at the WRC. We always stay in the "On the Rocks" cabin! Next time we will switch it up! Great friendly staff and easy to navigate website! What a perfect weekend getaway! Great prices, clean and comfortable! Felt like home away from home with a BEAUTIFUL view! The staff was pleasant and helpful. Amy was exceptionally accommodating via text and was anxious to help us with suggestions and directions. White River Cabins was just what we needed. It was spotlessly clean, well maintained, and the staff was pleasant and helpful. In order to help other guests have a wonderful stay, we suggest adding crock pots, extra dish soap, and a soap dispenser to the bathroom instead of bars. In the kitchen, it would be nice if cooking spray and olive oil were a part of the "fully stocked" kitchen supplies. Lastly, the noise from the cabin above us was much more than we anticipated. It was exceptionally noisy and made it hard to sleep. However, that concern would vary from guest to guest. Overall, it was a wonderful experience and we are thrilled to have found White River Cabins. The cabin was very inviting. The view was breathtaking. Thank you Art for helping out with my car! When we realized that we made a booking error, we called the office and we were very pleased with the no hassle response to adding an additional day to our stay. We were told no problem and immediately brought more towels and asked if there was anything else that we needed. The property is very clean and maintained well. The property is setup so you have beautiful views of the mountains the river and unforgettable sunsets. 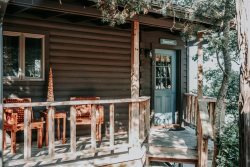 My husband and I loved staying at your cabins! The view was amazing and it was nice to have a whole cabin to ourselves. The grill and the outdoor furniture has been updated from what is shown on the website so that was a nice suprise! The owners are very friendly and accommodating, we were able to check in early since no one was staying there the day before us. The only thing was that there was no sign on the highway by the turn in. I knew where to turn in because it's on the same road as the Blue Springs Heritage Center but that wasn't a big deal for us! It's a little bit out of town and that was nice for us, only about a 5 or 6 minute drive! Amazing place, we definitely want to come back!!! The guy in the front office was absolutely amazing. Very friendly staff and made sure that our stay was as great as possible!!!! 10/10 customer service!!!! Property was very nice and clean! Above and beyond on expectations! View was amazing!!! !